Tops shoppers! 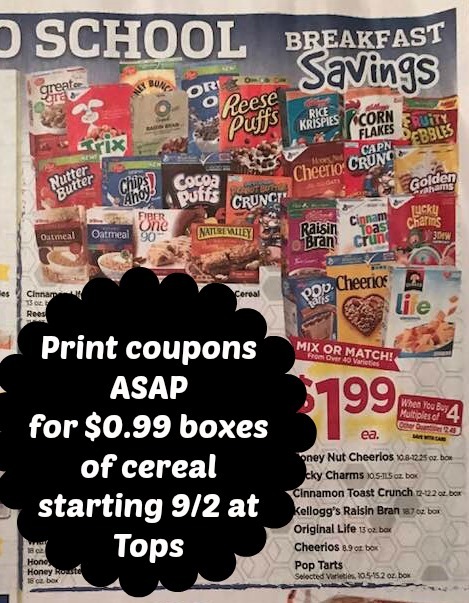 If you could use $0.99 boxes of cereal in your life, be sure to grab these printables if you haven't yet. They are set to disappear sometime today, August 31st. I do not know yet if they will be returning for the 1st of the month, but if so it just means more prints (and $0.99 boxes of cereal!) for us. Check out these matchups, with sale starting Sunday, September 2nd at Tops Markets. Make or Match Breakfast Cereal Sale - Buy in multiples of 4 and pay only $1.99 per box! Select cereals included. See ad for details. If you prefer printing all of the coupons.com printables mentioned below, click here to have them all selected ready to go! It sure will be a time to stock up on breakfast foods, just in time for back-to-school!